The original Mondavi pizza recipe dates back to a trip that Chris took with his parents to Napa Valley in 2002. The three of them were attending a farm conference nearby, which gave them the perfect excuse to visit wine country. On their visit to Mondavi Winery, they were served this pizza with a glass of Cabernet Sauvignon. 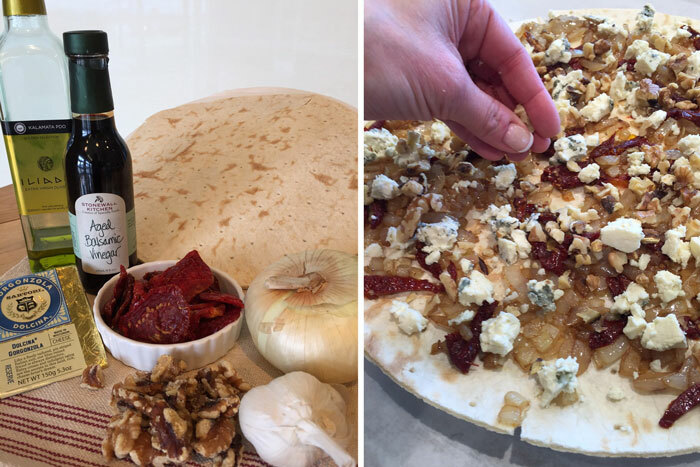 Sadly, I was not along but my favorite part of their trip, was (and still is) this red-wine-loving pizza recipe. Chris and I have made it many times since 2002, in fact, we don’t even reference the recipe anymore. In preparation for Eckert’s 2015 Wine and Food Festival, I needed to test the recipe while recording the exact portions. Mondavi pizza will be one of many recipes we will sharing at the Wine Festival and it happens to be my favorite of the bunch. With a few hints, this pizza can come together fairly quickly. I store sun-dried tomatoes in our freezer year-round. I thaw them for about 10 minutes on the counter and cut them with a kitchen shears. I also keep English walnuts on-hand in the freezer. This guarantees freshness and it is easy to pull out what I need for various recipes. The next step entails slowly cooking yellow onions in a little butter and oil. Cooking the onions for 20 minutes or more brings out their natural sweetness. Balsamic vinegar offers up some tanginess. Although the vinegar boils away, its flavor is absorbed into the onions leaving behind a delicious partner for the sundried tomatoes. After cooling and topping the pizza with the onion and tomato mixture, it’s time to crumble gorgonzola on top. For those who may be leery of blue cheese, there are many kinds of blue cheese and some are more potent than others. Creamy, salty gorgonzola definitely takes the complexity of flavors up another notch. Finally, toasted walnuts contribute earthiness and crunch. To toast the walnuts, I toss them into a skillet over medium heat until I can start to smell them (about 3 minutes). The combination of flavors in Mondavi pizza – salty, creamy, tangy, sweet and earthy - is more than memorable. So grab a bottle of Mondavi Napa Valley Cabernet and get ready to make a toast to the perfect pizza for wine-lovers! Preheat oven to 400°. Heat butter and olive oil in large sauté pan until foamy. Add the onion and cook over medium heat until tender, caramelized and light golden brown, about 15 minutes. Stir occasionally to prevent mixture from scorching. Add the garlic and cook for 1 more minutes. Then add the sun dried tomatoes. Stir in the balsamic vinegar and cook until vinegar has evaporated, 2-3 minutes. Remove from heat and let cool slightly. Top the pizza crust with sautéed mixture. Sprinkle with blue cheese, walnuts, and rosemary. Bake for about 10-12 minutes or until crust is crisp and cheese is melted.